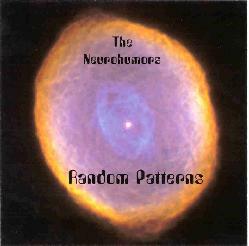 The Neurohumors - "Random Patterns"
This is a group of musicians from San Francisco lead by drummer David Jayne. The CD says that they are San Francisco's most psychedelic band. All the tracks here except two were recorded live in 2001. The other two are recorded at Jon's house in 1998. The music is nearly completely improvised and all recorded live to two tracks with no overdubs. Eric Pearson from Mushroom plays guitar and bass on two tracks as well. The opening track is a slow spacey number that is mostly lead by a piano line. Jam#1 follows and is a slow spacy jam with two extra guitar players. Purple, is another mellow space song. Jam #2 and #3 didn't really do much for me. Jam #4 features a guest electric violin player and this was a nice change. I had high expectations for this CD and was a little disappointed. I kept hoping to find the mellow space music to evolve into something psychedelic or far out but it never really does. I got kind of bored. I think the group of people have some sort of nice chemistry and I will look forward to hearing the next evolution but this CD was a little too boring for me. For more information you can email David Jayne of The Neurohumors at: davidjayne@earthlink.net. The CD can be ordered for $8 (postage included) from Electronic Audio & Images; 908 Potrero Avenue; San Francisco, CA 94110.